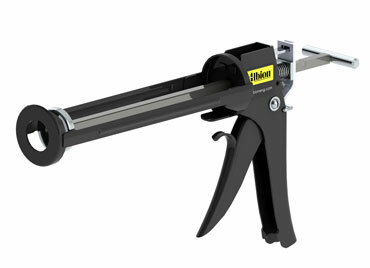 PRODUCT: Albion #380-5P HIGH THRUST 18:1 1/10 Gallon Cartridge Special Deluxe Plus Caulk Gun w/ Metal Carriage. Price/Each. Best For Special tool for hard to pump material, thick material and cold weather. Newborn Caulk Buddy. Clip on caulk finishing tool, together with two caps that save unused caulk. Price/Each.